The leading independent specialist for windscreen replacement and windscreen repair based in Lincoln and serving all of the Lincoln area. National Windscreens Lincoln fitting centre provides windscreen replacement and windscreen repair services to businesses and individuals throughout Lincoln and the Lincoln area. 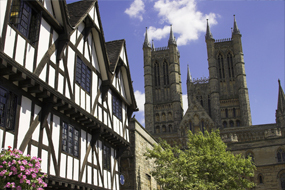 The city of Lincoln has many attractions and things to do, for example visits to the Cathedral, the Guildhall and Stonebow as well as museums and galleries. Lincoln’s economy is largely based on public administration, commerce and arable farming. As with many cities in the UK Lincoln is now quickly growing as an IT city. It is possible to go on guided tours of the city by qualified tour guides who have an excellent knowledge of the area. Furthermore it is also possible to go on the famous evening ghost walk around the city. The Lincoln windscreen fitting centre and its mobile vehicle glass technicians service the needs of Lincoln and the surrounding area including Sleaford, Newark-on-Trent, Nettleham and Horncastle. With 108 fitting centres and over 800 mobile technicians, National Windscreens operates the UK's largest windscreen repair and windscreen replacement network. The company provides low cost, high quality windscreen replacement and windscreen repair from its Lincoln fitting centre 24 hours a day, 7 days a week, 365 days a year. Repair and replacement of all types of vehicle glass including windscreens, rear windows and side windows is undertaken throughout Lincoln and all of the Lincoln area.